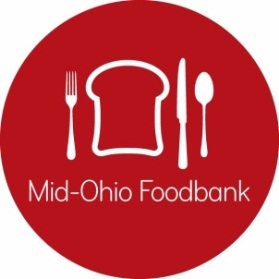 Sources of food for the Mid-Ohio Foodbank include the United States Department of Agriculture (USDA), food manufacturers, local produce growers, community organizations, and Ohio businesses. Our network of 680 member agencies directly distribute the vast majority of the 66.5 million pounds of food the Mid-Ohio Foodbank handles each year. Through these partnerships, we provide more than 140,000 meals each day for hungry people in central and eastern Ohio. Cynthia has faced huge challenges. She earned a master’s degree and had a good job working in human resources. Then she was diagnosed with cancer. The doctors were able to remove her tumors, but the medicine they prescribed made her very sick and unable to work. Being unemployed, she couldn’t afford a nutritious diet – something that’s critical to maintain her health. The local Mid-Ohio Foodbank Produce Market makes a huge difference for Cynthia. “The free, whole foods I receive are what I need to heal,” said Cynthia. Mid-Ohio Foodbank delivers fresh fruits and vegetables to her local church for a farmers’ market style distribution to neighbors struggling to feed themselves and their families. We collaborate with community partners to transform lives. It is only when everyone in our community thrives that we have any hope of ending hunger. The Kroger Community Pantry is located within the Mid-Ohio Foodbank at 3960 Brookham Drive in Grove City. The choice style pantry was established in January 2012 and serves hungry neighbors from Franklin and surrounding counties. The pantry is also a learning-lab, providing first hand knowledge into the challenges faced by our agency partners and customers.